My car had really bad flood issue last September after which I replaced the coils with LS2 Coils, the plugs and the wires. Car has been running good since. 2 weeks ago, I noticed that when in 1st gear at low rpm, the car shudders and hesitates a little requiring a lot more throttle then usual to get it going, same thing in second etc. Happens even when the car has had a long time to warm up. When I go into the higher RPM like when merging onto the HWY, I'll get a blinking P0301. I also got the P0850 last week, not sure if this could be causing my low rpm shuddering issues? At Idle, when I listen to the exhaust at the muffler tip it does still sound like it's shuddering, not a constant smooth sound. I removed the Neg batt cable, did the E-shaft reset as well as the holding the odometer button reset, didn't help. If replacing the idle/park switch would fix this then that's good, if not I'm thinking Clogged Cat? Car is out of warranty of course. P0850 Neutral switch input circuit problem ON 2 CCM, check connection? Definitely would change the plugs first. No, I did the coils myself, I know, I'm a bad person for not going BHR. 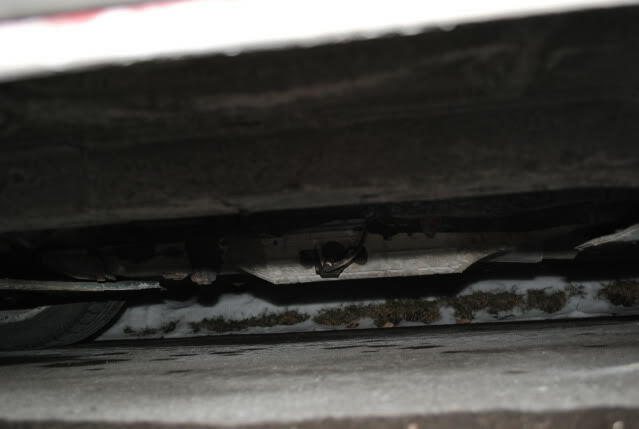 Anyways, car ran fine for months, so could a bad cat cause these issues? If the Cat is clogged, could it cause a misfire? Sorry Charles, I had been flamed before for doing my own thing, if I could have gotten yours I would have for sure. Anyways, yes, it happened all of a sudden and has been happening since and it's more at low RPM 2-3000rpm it kinda hesitates and shudders while stepping on the gas then it gets going ok. Then if I rev her high while WOT I'll usually get a flashing P0301. When I'm at a light stopped for a bit, I can smell gas/oil/exhaust in the car. I checked and my oil consumption is normal/very little actually so I don't think I'm burning oil that much. Ok, drove home tonight on my normal 45 min drive, got out and looked under the car and the O2 bung and surrounding area on the Cat was GLOWING red. I rushed in the house to grab the camera but the fancy DSLR didn't want to take a picture in the "dark" so this is the best I could do. If I show up at the dealer, will they just check it out/take my word for it and replace for me? What is the Emmisions warranty on this car? I made an appointment for 1pm today.....hope it goes well. Last edited by sebarx8; 01-14-2010 at 09:29 PM. Won't be an air pump issue....but it could be an ignition problem....Did they check that when you had it replaced? probably not, originally when i got a CEL 4 days after service, they said it was the "fuse for the air pump" >> they didn't even test the pump. 2 days after when i get the fuse they say "oh actually the it's the pump thats shot" >> morons. & they left the fuse in to blow again, ... i took it out. im pretty sure its the coils. im getting a strait pipe and only using the pump and cat for etest. ppl in here suggesting plugs and coils... DID ANYONE READ THE FIRST POST? he just got them changed. I'm not a veteran around here, but everyone suggests that all the time for every thing. and on top of it HE JUST DID THAT... if you don't know what your talking about don't comment. Last edited by Iluvmy8; 01-17-2010 at 06:51 PM.